With her recent breathtaking rendition of Louis Armstrong’s “What A Wonderful World” featuring the Southern California’s Children’s Chorus at the Oscars, a spot in Pharrell’s super-artist roster during the show (playing bass with the orchestra), and her monumental Grammy win for Best New Artist last year, it wouldn’t be incredulous to say Esperanza Spalding has been quite the busy bee. Now, with her 4 studio album release Radio Music Society coming up on March 20th, she has both skeptics and fans alike all in a tizzy. If you’re already familiar with Esperanza’s work, it’s amazing to hear just how uniform, consistent and fresh she is. 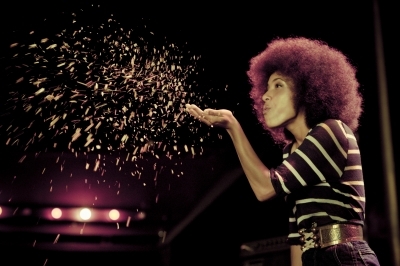 Radio Music Society is without a doubt laced with Esperanza’s signature light-as-a-feather vocals and jazz/soul-infused sound, accented with an Afrocentric groove and fantastic guest appearances picked from the cream of the crop – Algebra Blessett, Q-Tip and Lalah Hathaway to name a few. And that’s only the beginning. The album begins on the right note with “Radio Song,” a fun and melodic track that just doesn’t let up. Its Top 40 friendly feel and lyrical content go hand in hand. The blazing brass on “Crowned & Kissed” is a precursor to what you can expect on the track. Proclaiming her love and support to her love, from Queen to King; it’s certainly fitting. The powerful single “Black Gold’ featuring Algebra Blessett, is an ode to the African American man who is “black gold with the diamond soul.” Algebra and Esperanza compliment each other naturally on vocals, leaving absolutely nothing more to be desired. The fabulous “Hold On Me” is reminiscent of greats from the past: a little Lena Horne, with a dash of Ella’s grace and control. With composure and a purr, Esperanza takes the horse by the reins and never let’s go. The surprise on the album comes in the form of the stellar Michael Jackson cover of ‘I Can’t Help It.” Esperanza managed to take a favourite and make it her own. There’s no mistaking the jazz undertones, but to hear Micheal’s song with a whole other twist is absolutely outstanding. It’s not difficult to shower Radio Music Society with accolades. From start to finish, it is an impressive album that will get you prepared for Esperanza’s upcoming tour. While you’re updating your Esperanza Spaulding collection, make sure to take note of March 20th! Don’t let the day pass you by.